Pittsburgh Penguins forward Evgeni Malkin, right, and his new line may see many of these goal celebrations throughout the upcoming season. While all eyes are on Phil Kessel and how the offseason acquisition meshes with captain Sidney Crosby, another grouping has the Pittsburgh Penguins feeling pretty good about themselves as well. Evgeni Malkin and linemates Patric Hornqvist and Sergei Plotnikov revealed a bit of their personalities by donning taped glasses to honor the Hanson Brothers of “Slap Shot” fame prior to the team's preseason tilt versus the Tampa Bay Lightning. When the puck dropped, however, it was all business as the line combined for two goals and four assists in the Penguins' 4-2 victory on Tuesday. Malkin collected 28 goals in 2014-15 and is just three seasons removed from his 50-tally performance. The former Hart Trophy winner showed remarkable chemistry in his first campaign while paired with Hornqvist, who had no issue skating into the dirty areas to convert Malkin's passes. Hornqvist scored 25 goals and set up 26 others in his first season with Pittsburgh. The 28-year-old Swede's 51 points were two shy of the career high he recorded with the Nashville Predators in 2013-14. 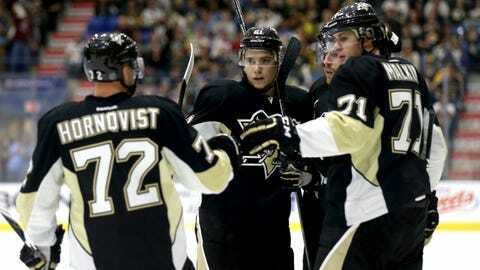 Added into the mix is Plotnikov, who has played six seasons in the Kontinental Hockey League. The 25-year-old Russian, who collected 44 goals and 101 points in the last three campaigns with Yaroslavl Lokomotiv, uses a physical style that meshes well with his new linemates.